Justin Paul Tucker (born November 21, 1989) is an American football placekicker for the Baltimore Ravens of the National Football League (NFL). He played college football for the University of Texas. He was signed by the Ravens as an undrafted free agent in 2012. Tucker graduated from Westlake High School, outside Austin, Texas, where he was teammates with Kansas City Chiefs quarterback Nick Foles. Tucker played for the Texas Longhorns football team while attending the University of Texas. In 2011, concluding a 118 game rivalry with Texas A&M University and the University of Texas, he kicked the game winning field goal as time expired. Texas (then ranked No. 25) won, 27-25. He played in the 2008 U.S. Army All-American Bowl. While attending University of Texas, Tucker majored in Music; his degree path was in Recording Technologies. Justin Tucker attempts a field goal in Super Bowl XLVII. An undrafted free agent in the 2012 NFL Draft, Tucker was not selected by any of the 32 teams. However, the Baltimore Ravens signed him on May 29, 2012 to begin workouts and camp for the Ravens alongside placekicker Billy Cundiff. After impressive showings and accurate field goals during the team's preseason games, Tucker earned the starting job as the Ravens official placekicker upon Cundiff's release from his contract with Baltimore on August 26, 2012. In his debut season, Tucker proved to be a very accurate kicker, making all 42 of his PAT attempts while missing only 3 out of his 35 Field Goals. During Week 3 against the New England Patriots, Tucker kicked a game winning field goal with 2 seconds left, giving the Ravens a 31–30 victory and their first ever regular season victory over the Patriots. On January 12, 2013, during the divisional playoff round game against the Denver Broncos, Tucker kicked a 47-yard field goal in double overtime to win the game (later known as the Mile High Miracle) and sent the Ravens to the AFC championship for the second consecutive year. During the 2nd quarter of Super Bowl XLVII against the San Francisco 49ers, Tucker failed in converting the first fake field goal attempt in Super Bowl history, coming up just one yard short of the nine needed for the first down. Nonetheless, the Ravens went on to win the game, giving Tucker his first Super Bowl ring. The following 2013 season, despite missing two field goals in Week 2 against the Cleveland Browns, Tucker continued his success as an accurate kicker for the Ravens. He kicked the game-winning field goal in overtime against the Cincinnati Bengals, letting the Ravens win 20-17. He was named AFC Special Teams Player of the Month for November. On Thanksgiving, Tucker kicked five field goals en route to the Ravens' 22–20 win against the Pittsburgh Steelers. He was also selected as the player of the game along with Jacoby Jones by John Madden. He brought his holder, Sam Koch and long snapper, Morgan Cox, to accept the award on screen with him. Tucker kicked a franchise record-tying six field goals that were the Ravens' only points in an 18–16 win against the Detroit Lions in a Monday Night Football game at Ford Field in Detroit on December 16, including a personal (and franchise) record 61-yard field goal in the last minute to seal the victory. During the game, Tucker became the first NFL kicker to kick a field goal in the 20s, 30s, 40s, 50s, and 60s in the same game. Tucker's 61-yard field goal also set the NFL record for longest field goal in a domed stadium. Tucker was elected to his first Pro Bowl to end the 2013 season. He was also voted 1st team All-Pro by AP voters. On February 26, 2016, the Ravens placed the franchise tag on Tucker. Tucker signed the franchise tender on March 4, 2016, which would pay him $4.5 million. Justin Tucker signed a 4-year, $16.8M deal extension on July 15, 2016. In Week 12 of the 2016 season against the Bengals, Tucker kicked four field goals, three for over 50 yards in 19-14 win, earning him AFC Special Teams Player of the Week. Tucker is a practicing Catholic and makes the sign of the cross before every kick. Tucker is also a proficient opera singer, and in the past has been asked by both the Baltimore Symphony Orchestra and New York Opera for performances, although was unable to comply. In 2015, Tucker was contracted by Royal Farms to sing in their line of commercials. Even more recently, Tucker sang "Ave Maria" for a Catholic Charities benefit concert with the Concert Artists of Baltimore." Tucker married fiancée Amanda Bass in March 2015 after meeting in college and dating for 6 years. They had their first child, Easton, on May 10, 2016. ↑ NFL Baltimore Ravens Player Profile at NFL.com. Retrieved November 1, 2012. ↑ "Texas tops Texas A&M in thriller". USA Today. Retrieved January 3, 2015. ↑ "Justin Tucker's Lovable Weirdness". www.baltimoreravens.com. Retrieved 2015-12-13. ↑ Mink, Ryan (2012-05-29). "Ravens officially sign kicker Justin Tucker". BaltimoreRavens.com. Retrieved 2012-08-27. ↑ "Ravens release Kicker Billy Cundiff in favor of rookie Justin Tucker". Bloomberg News. The Times-Picayune. 2012-08-27. Retrieved 2012-08-27. ↑ Maese, Rick (2013-01-12). "Ravens vs. Broncos: Baltimore reaches AFC title game after Justin Tucker's field goal wins it in double overtime". The Washington Post. Retrieved 2013-01-14. ↑ Profile, nfl.com; accessed January 3, 2015. ↑ Hensley, Jamison (February 26, 2016). "Justin Tucker to make $4.5 million under franchise tag". ESPN.com. Retrieved March 6, 2016. ↑ Sessler, Marc (March 4, 2016). "Justin Tucker signs franchise tender with Ravens". NFL.com. Retrieved March 6, 2016. ↑ Ravens rookie talks faith and football by Jennifer Williams, Catholic Review; retrieved October 31, 2012. ↑ , ncregister.com; accessed January 3, 2015. 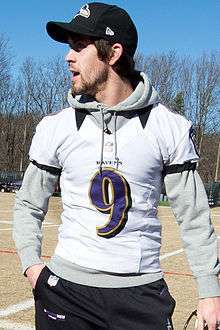 1 2 "Baltimore Ravens kicker Justin Tucker shows off vocals". UPI. Retrieved 2015-12-13. ↑ "Ravens kicker Justin Tucker sings opera in Royal Farms commercial, becoming Peyton Manning". baltimoresun.com. Retrieved 2015-12-13.